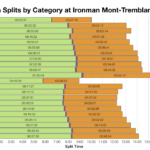 Like Sweden, Ironman Mont-Tremblant also entered it’s fourth year of racing at the weekend. Taking place on Sunday it offered 50 Kona slots for the 2,300 age group athletes who finished. 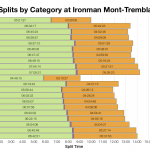 This year’s race was slower than usual for this event, largely thanks to the run. 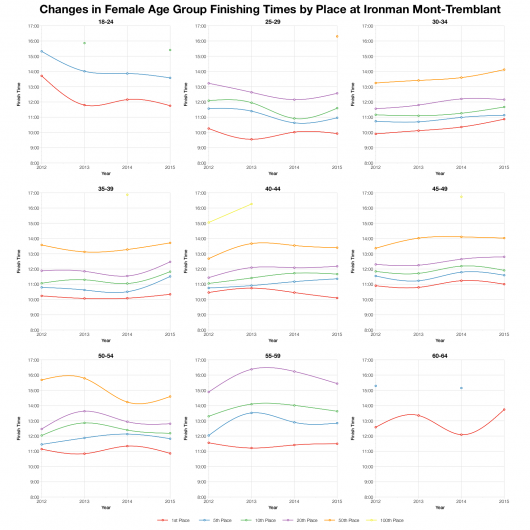 Differences between this year’s swim and bike medians and those of the past are largely insignificant. 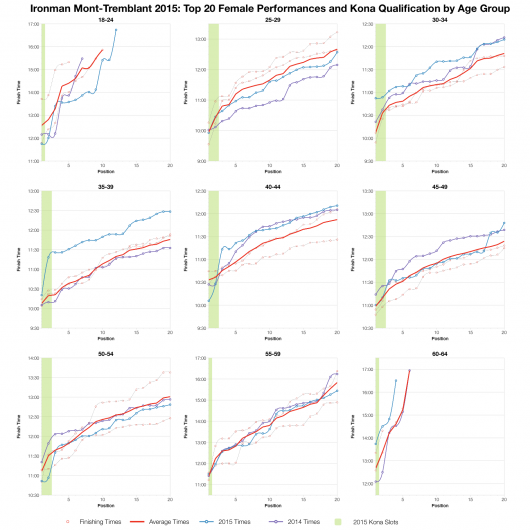 The run however sees a definite slowing in both the age group and professional ranks. 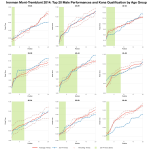 The change becomes more apparent when comparing result distributions – the run is shifted in the order of 15-20 minutes to the right. This slow down carries through to the final finish times seeing an equivalent adjustment in overall results. Over a 10+ hour race this is not the largest of changes; it might suggest slightly tougher conditions, but not of serious magnitude. 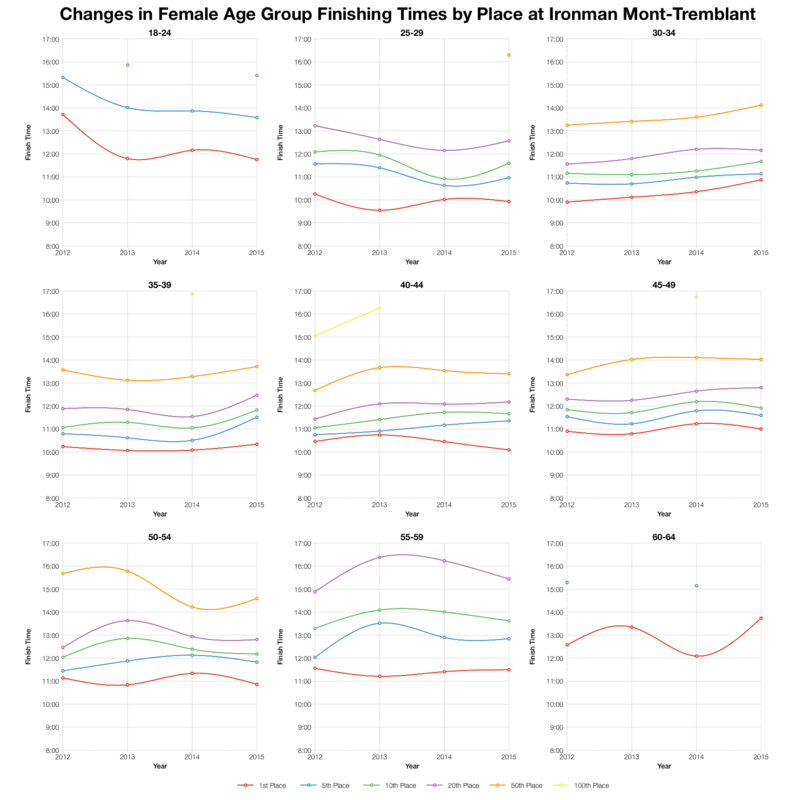 If we look at how finishing times have changed for age groupers over the last four years we again see that this year’s results tend to be a bit slower. It’s still a small change though. Mont-Tremblant is not the fastest course anyway, this year was only a touch slower than we’ve seen. 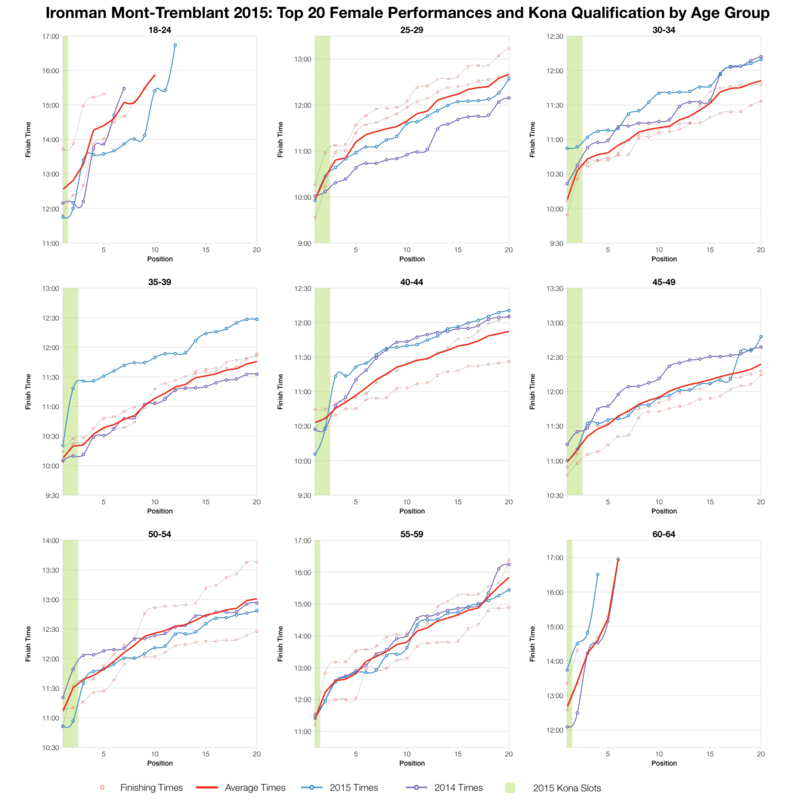 To finish, the top twenty age group times and Kona qualification. 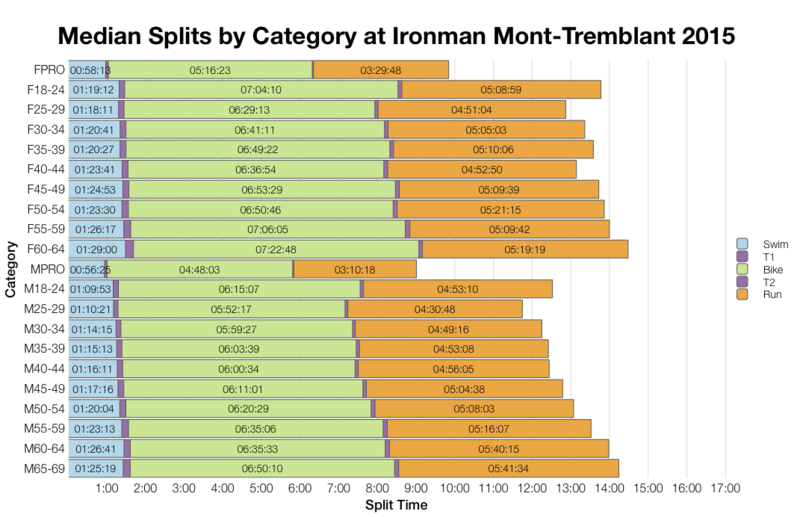 Some were slower than average, some faster, but there’s no overall pattern here. 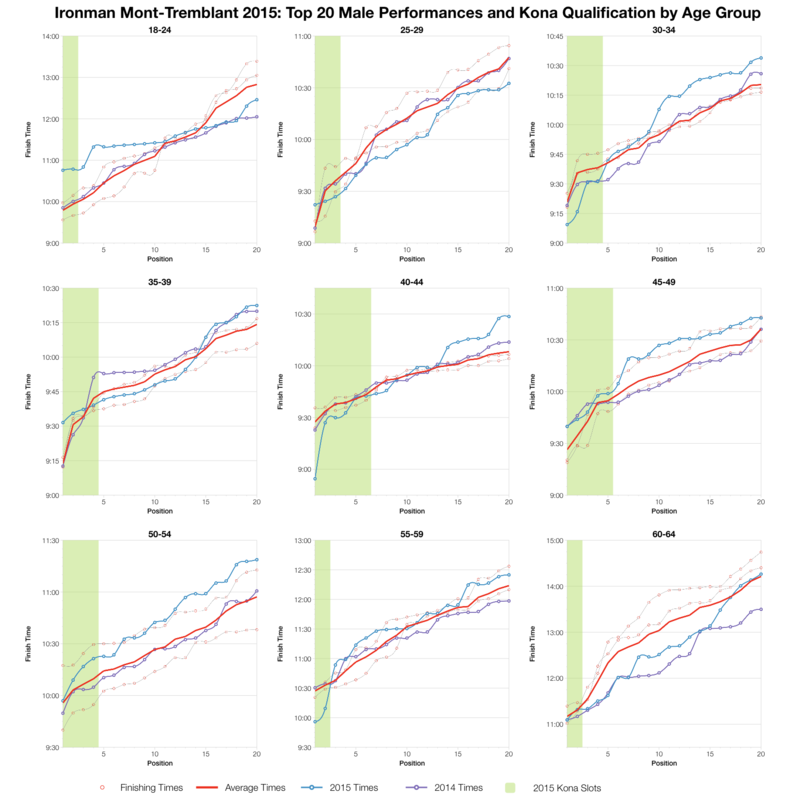 Age groups vary, but aren’t really falling significantly far from the previous averages for the top twenty. 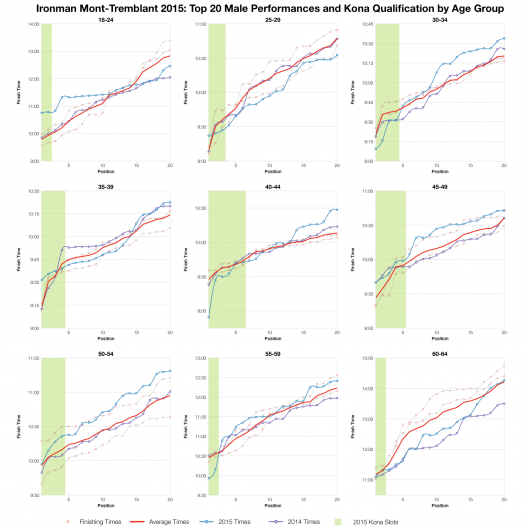 From a qualification perspective it was as competitive as usual; at the same time fewer slots were on offer this year making the task a little more challenging. 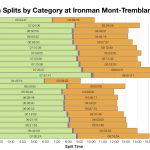 A spreadsheet of the full results and splits from Ironman Mont-Tremblant 2015 is available on my Google Drive.